I received one of the first batches of machines sent out into the wild, being delivered in late March. I’ve run quite a number of jobs with it and am generally very pleased with this new model. 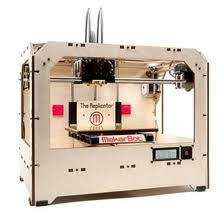 I have the dual extruder version. Here is some early experience feedback from my one month of use. First, the machine came incredibly well packed, with custom cardboard inserts and clever use of materials to cushion the bot. No damage was found from shipping. Setting it up was pretty simple, although I found the leveling of the build plate to be fussy (more on that below). My first test print from the SD card went fine. As I already had a supply of several color ABS spools, I opted for the “standard” order which comes with two spools of ABS: natural and black. The good: it works! Part build quality is very nice and compares favorably to a uPrint ™ machine from Dimension that costs $15,000 that I have in my lab at work. In fact, it would be very hard for someone to tell the difference, with the notable exception that the uPrint machine only will accept natural ABS and they do not sell tinted material for it (for that you have to purchase the next model up at $19,000). MakerBot ABS works out to about 65 cents per cubic inch while the “professional” materials for the uPrint ™ are $4.66 a cubic inch. The bad: well, a few annoying bugs cropped up the first month. Getting a part to stick to the build surface can be a real problem. I’ve followed the cleaning and leveling instructions and still have had issues with builds that have long dimensions on the platform. Raising the build plate temperature to 105C helped. And the 4 screws used to level the build plate are just barely long enough to do the job and retain some tension on the springs that are meant to keep things tight. One of the thumbscrews fell off during a build from vibration. I also hear that they have increased the thickness of the aluminum build plate in models shipping now -mine is slightly warped so that the edges bow up from the center which is the lowest point. The x-axis limit switch is not mechanically fixed to the PCB it is soldered to, so with time it became angled up off the board and didn’t trip at the end of travel when homing the x axis. A spot of glue puts it in place permanently. I also ran into a bug when switching from dual to single extrusion. Moving from a just finished dual extrusion job to a single extruder, the head not being used is still pretty hot. This seems to fool the software and so the machine actually times out with a head error and shuts down after a bit thinking that the unused extruder should not be hot. The solution I found was to let the machine cool down completely and then start the single extruder job. But this certainly slows things down if you are looking to build a number of parts in sequence. And, a bug in early hardware (mine included) is that you can’t load or remove an SD card when powered up or bad things can happen. I don’t know what the exact hardware problem is. So far I’ve not encountered it, but do plan on powering it off before exchanging SD cards. Also, just a small gripe – at this price, you’d think they could provide the machine with a coat of polyurethane on the plywood, but none of the wood surfaces are protected. Even so, all in all this is light years ahead of the CupCakeCNC machine they started with (and my model still makes parts!) and higher quality than the ThingOMatic. Now if they would offer a good 3D scanner!